At Dental Smiles our goal has always been and will continue to be a desire to educate and inform each and every patient of the variety of affordable dental procedures available in a friendly and comfortable atmosphere. From the moment you enter our office, our entire team is committed to making your dental experience a positive one and ensuring excellence by our group of dedicated, competent, and caring team of health care professionals. We know how anxious a visit to the dentist office can be, so we focus on your needs and concerns. Whether your concerns are cosmetic or restorative in nature, we have the solutions for you. 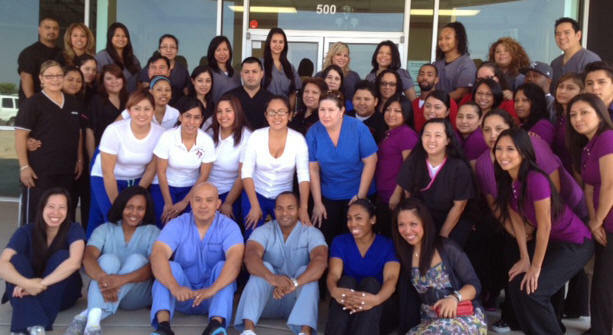 For years we have been helping Houstonians afford quality dental care and that commitment continues today. We have several locations throughout Houston for your convenience. So don’t be caught with an ugly smile. Call and make an appointment today and be the next happy customer to say, “I got my smile at Dental Smiles”.